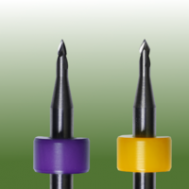 Tip diameter - 0.0050 in. ±0.0002"
Shank dia. - 0.1250 in. (3.18 mm) +0.00, -0.0002"
60° & 45° tips optimized for engraving non-ferrous metals, hardwoods, phenolics, stabilized woods and composite minerals.